Very soon we will celebrate Valentine’s Day – an amazing holiday dedicated to all lovers. For many people, this is an occasion to please a beloved person and a good opportunity to tell him or her about their feelings. And, of course, on this wonderful day you want to create a completely special atmosphere in your home – the atmosphere of love and romance. 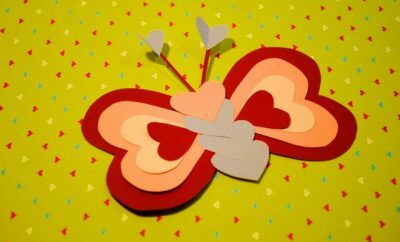 What would a Valentine’s Day be without a wide variety of Valentines and hearts everywhere? 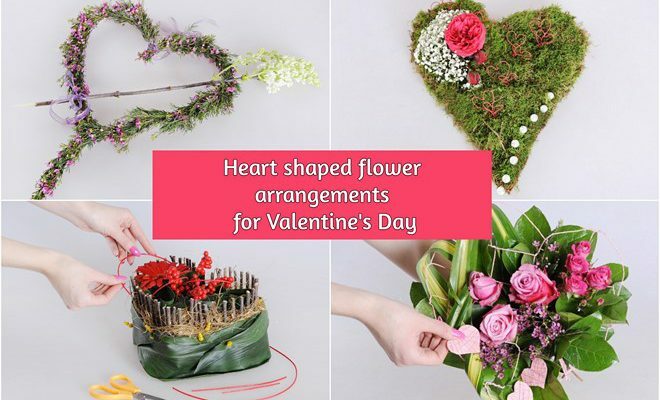 We want to show you how to make an unique heart shaped flower arrangements, which can also be considered a great and very original gift ideas. These wreaths and bouquets could be also a very sweet and touching decoration, which, no doubt, will help create a festive atmosphere in the house. 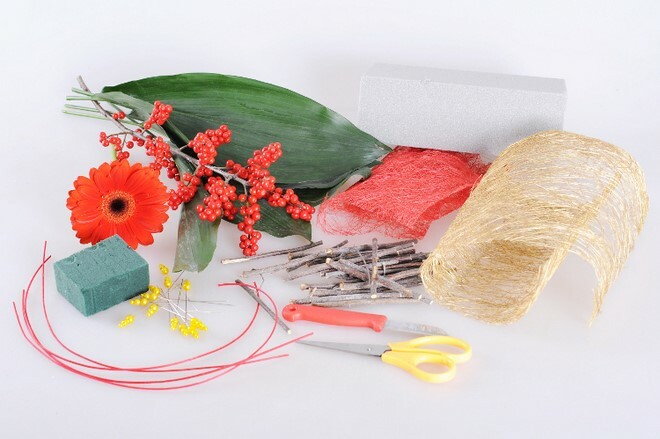 For this project you will need: one gerbera flower, ilex berries, aspidistra leaves, twigs (preferably, of equal thickness), decorative sisal mesh of golden and red color, pins, floral foam, decorative red wire, scissors and a small knife. 1. 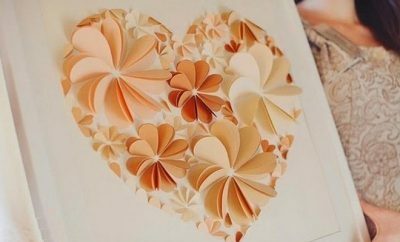 Cut the floral foam with a knife to create a heart shape. This will be the base of your centerpiece. 2. Then, cut all twigs to the same length and stick them along the edge of the heart. 3. Using pins, secure the Aspidistra leaves on the floral foam. 4. The sisal mesh adds an eye-catching texture to the floral arrangement. Loose the nylon strings with hands and insert them over the sticks. 5. Take a piece of red sisal mesh and cut out hearts to decorate the centerpiece. 6. The perfect finishing touch for your centerpiece will be a delightful gerbera flower. Cut out a small rectangular piece from the leftovers of the flower foam, soak it in water and put it in the upper left corner, over the sisal. 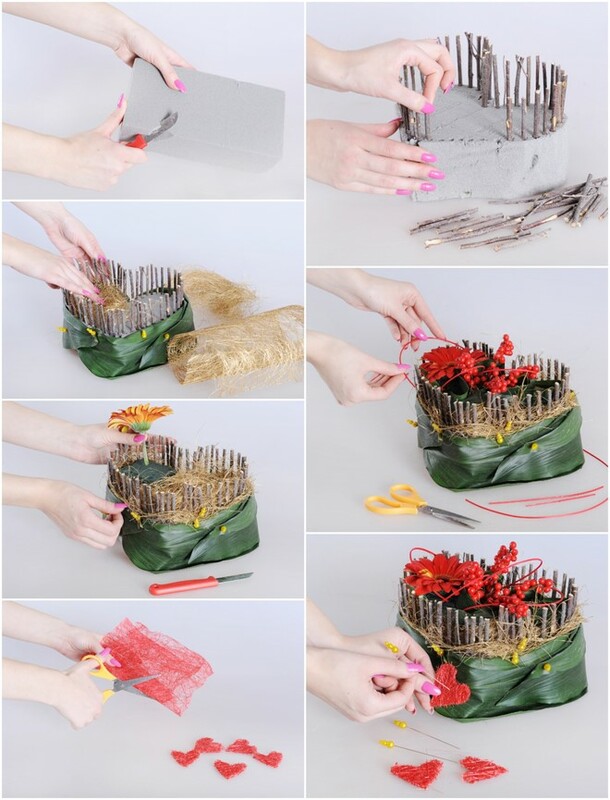 Cut the flower to size and insert it into a prepared piece of flower foam. That way the flower could keep its freshness longer. 7. Decorate the heart with the bright red ilex berries and complete with the pieces of wire. 8. At the end secure the sisal hearts using pins. This interesting and romantic flower arrangement can be an unique element of your home decor on Valentine’s Day! 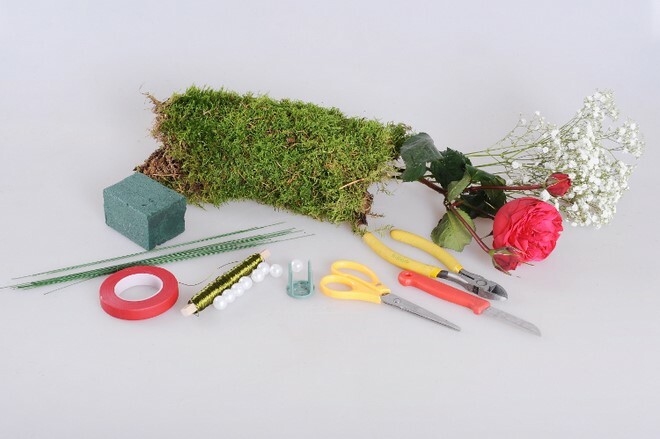 You will need: living moss (fresh sheet moss), rose, gypsophila (baby’s breath), floral foam, hard wire, decorative florist wire, pearl beads, red floral tape, plastic pin holder “frog” (you can buy them in specialized stores or do it yourself), scissors, knife and wire cutters. 1. First of all, you need to make the wire frame. Alternatively, you can buy a ready wire heart wreath frame and use chicken wire inside the frame to attach the moss. It is absolutely not necessary to try to make the frame beautiful, because it will be hidden. 2. Cover the wireframe with moss. In order to attach the moss on the frame use the decorative wire as a thread and make a few “stitches” through the mesh and moss. 3. The flowers must be placed on the floral foam, so that they remain fresh longer. 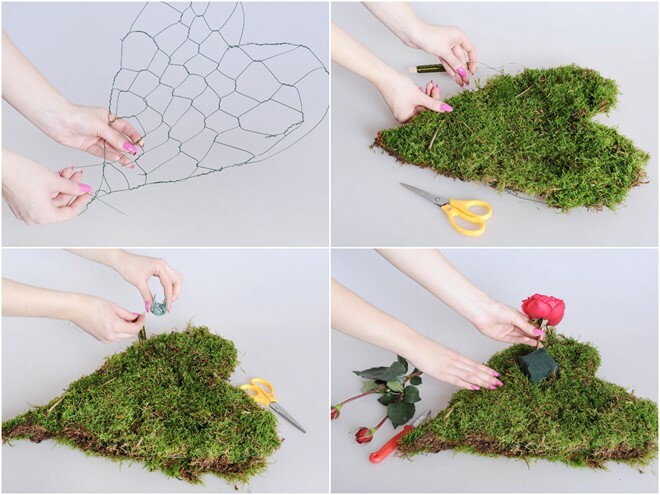 In order to insert the floral foam on the heart shaped moss centerpiece, use a plastic pin holder described above and fix it with floristic wire. 4. Cut a small piece of floral foam, soak it in water until it reaches the bottom and then secure it on the pin. Insert the rose blossoms and gypsophila into the floral foam to cover it completely. 6. 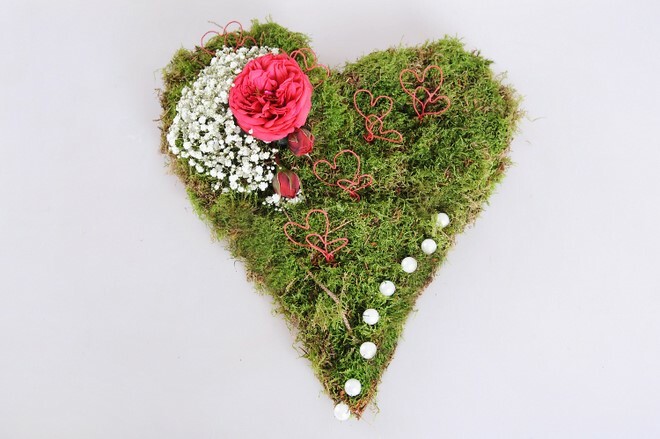 Thread white pearl beads through wire and to create “stems” and decorate the moss heart. 7. 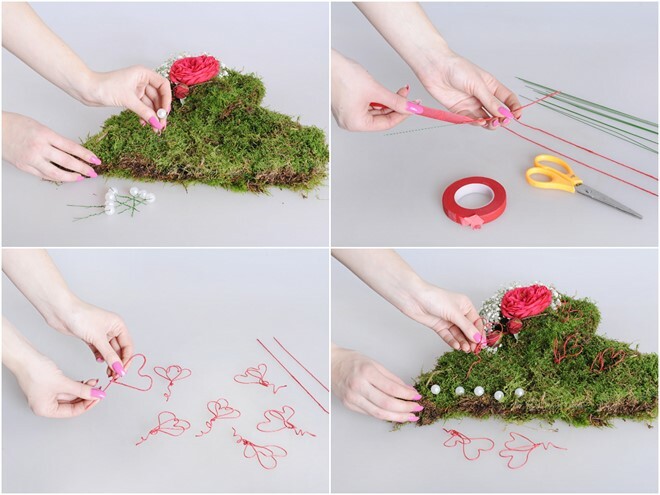 Wrap the wire with red floral tape and bend it to form small hearts. Leave again 1-2 cm at the end so that you can insert them later in the moss heart. These wonderful ornaments will add a pop of color to the moss centerpiece. You will need: pink “single-headed” roses (3 pcs. ), Shrub roses (1 pc. ), Salal greenery, Dracaena leaf (preferably two-colored), Chamelaucium (1 pc. 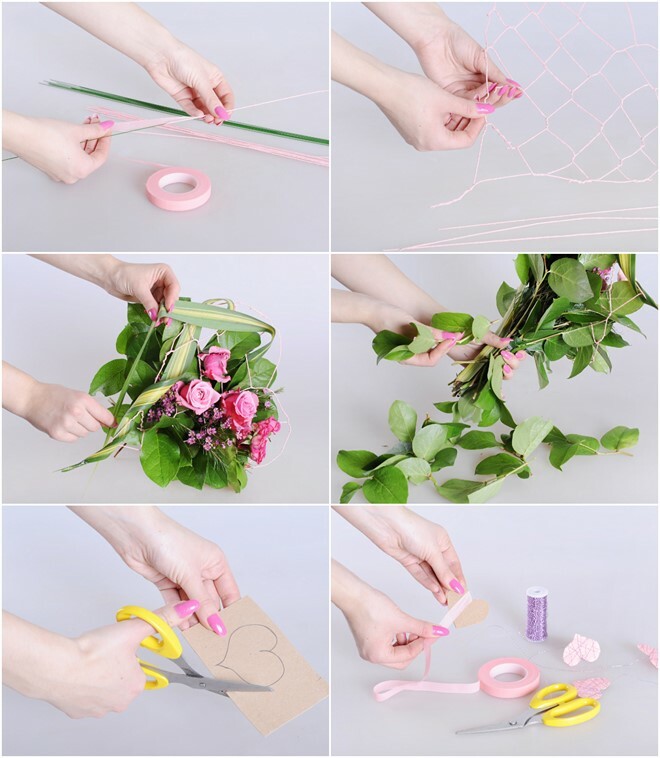 ), floristic wire, decorative wire, pink or lilac tape, five green beads, a piece of cardboard, a knife and scissors. 1. 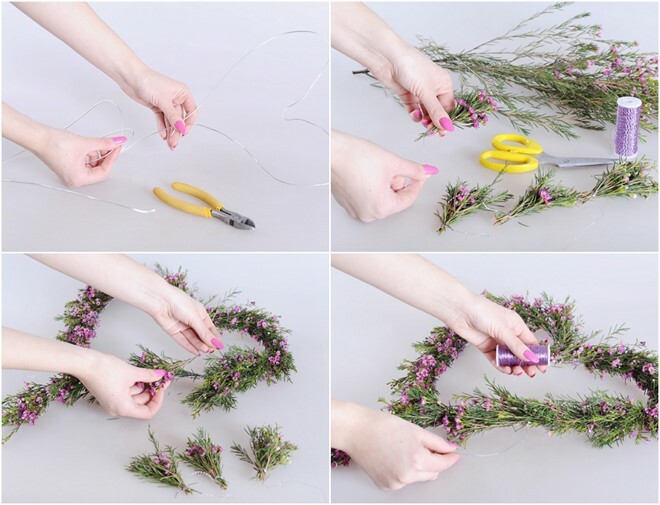 First, wrap the entire length of the floristic wire with tape. 2. From the prepared wires, weave the heart shaped frame, as shown on the picture. 3. Gather the flowers into a bouquet, passing the stems through the cells of the frame. Add the rose leaves between the blossoms. 4. The “tail” of the wire heart looks quite rude, so you need to decorate it. Secure the dracaena leaf using decorative wire around the twisted wire. Pass the leaf through the cells of the frame, decorate it flexibly and fix the tip (if necessary – using the same decorative wire). 5. Wrap the bouquet with Salal greenery and secure it using decorative wire. Use a bunch of leaves pointing down around the base of the bouquet, as well. 6. Cut the decorative wire into segments of different lengths. Thread a bead on each wire and twist the wire tip. 7. The free ends of the wires must be tied to the bouguet in such a way, that the beads hang at different levels. 8. The symbol of the holiday of lovers is the heart. On the cardboard draw five small hearts and cut them out. 9. Decorate the hearts with a pink or red tape and wrap around decorative wire in different directions. The ends should be long enough for attaching on the bouquet. 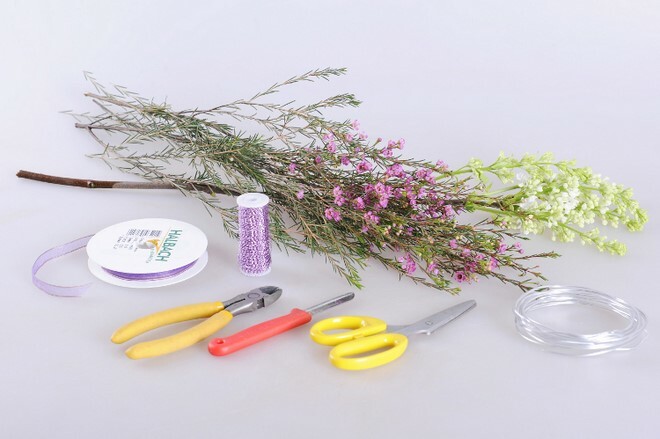 You need: one straight twig of white lilac, sprigs of Chamelaucium, a narrow sheer fabric ribbon, decorative wire, thicker wire for making the heart shaped base (it should not be very thin), wire cutter, small knife and scissors. 1. Use the thicker wire to form the heart shape. Wire bends easily, so making such a frame is very simple. 2. Chamelaucium is a very beautiful plant from the Myrtle family. 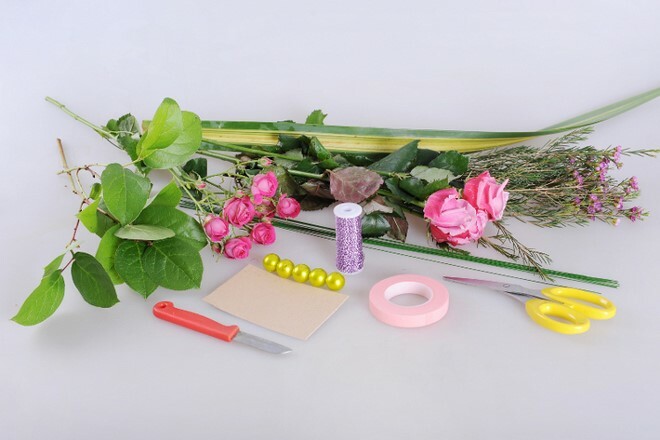 Gather the blooms into small bouquets and tie them together using the decorative wire. Then, secure them densely to the floral wreath. 3. 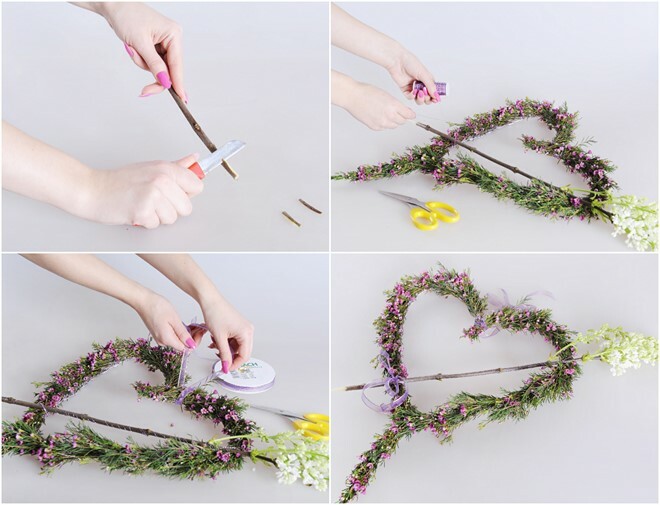 A very ordinary straight twig of lilac can become a wonderful Cupid’s arrow, piercing the heart. Sharpen the tip, so that it looks more like a real arrow. 4. Using a wire, fix the arrow on the heart-shaped wreath. 5. To hang the floral heart on the wall use a sheer purple ribbon. For harmony tie one more bow, where the arrow pierces the heart. 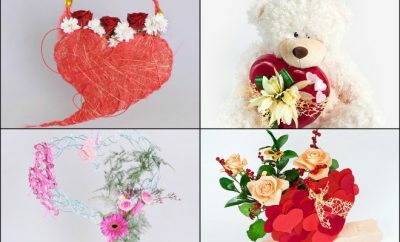 Our floristic compositions for Valentine’s Day are ready. Whatever version you choose, it will help you create a romantic atmosphere on Valentine’s Day and make your holiday truly unforgettable! ← Previous Story 5 Ideas for homemade flower gifts to brighten up her Valentine’s Day!